“The Voices of Baseball” — Mel Allen, Red Barber, Vin Scully, Harry Caray, Jack Buck, Ernie Harwell,Bob Prince, Etc. The eventual transfer of the Braves would be a key to opening the door for relocation in the National League, as no movement had occurred by franchises in 50 years. But with the Braves’ shift to Milwaukee for the 1953 season, the Dodgers in Brooklyn and the Giants in New York, both playing in stadiums built in the 1910s, had to at least take note of possible opportunities in the future from alternate sites. As Milwaukee’s attendance was nearly twice that of the Dodgers, O’Malley felt added pressure to resolve the new stadium issue for fear of not being able to compete with the Braves. The city of Vero Beach could not have been prouder of new Holman Stadium. For Holman, the honor was one of civic pride in the small-town community, though his son Harry “Bump” Holman stated in an interview about his father, “He really didn’t know anything about baseball.”James Kirley, Vero Beach Press-Journal, February 20, 1988 However, Bud Holman knew spring training baseball was good for the community and he later became a rabid fan of the Dodgers. The name of Vero Beach is somewhat of a puzzlement. Though theories abound, one of the most popular ones is when “Henry T. Gifford asked the United States Post Office for permission to establish a post office in his own home (on September 28, 1891). Ironically, on the application it appears the U.S. Postmaster thought ‘Vero’ was an error, and he wrote over the first letter and put a ‘Z’ to make it ‘Zero.’ Mr. Gifford corrected the postmaster by drawing the letter ‘V’ with very thick lines.”Pamela J. Cooper, Indian River County Main Library, Florida History & Genealogy Dept., Dec. 3, 1996, rev. April 2001 Some believe that Gifford’s wife was actually named Vero. 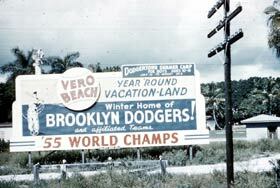 Whatever its actual origin, Vero Beach grew in popularity and prominence largely due to the vast publicity it received after the Dodgers arrived there. The writers from New York put Vero Beach datelines on their stories, explored surrounding attractions such as the McKee Jungle Gardens and it was not too long before the lure of warm weather and the Dodgers brought many snow birds south to see it for themselves. Some permanently fled the snow and city life of New York for the slow-paced Eastern seaboard town. While nothing is ever easy when dealing with cities and municipalities as O’Malley would repeatedly find out whether it was in New York, Vero Beach or Los Angeles, he did what he needed to do to keep advancing forward. In Vero Beach, the city had agreed to turn over gate receipts of two spring exhibition games to the Dodgers in order to have the ballclub install lights on “No. 3 Field,” as it was called at Dodgertown. 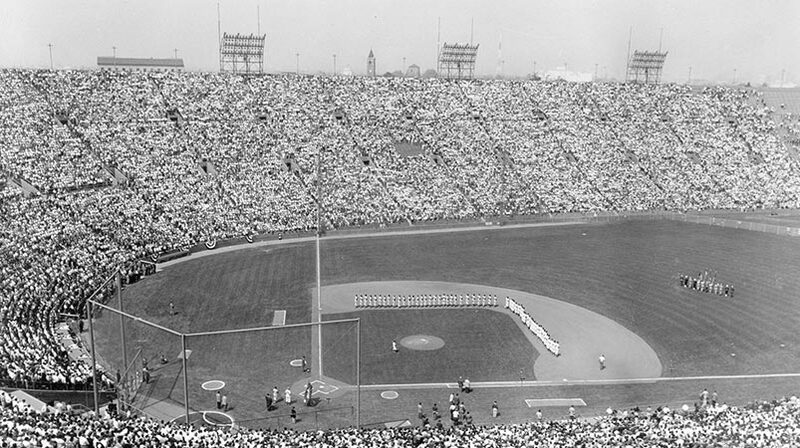 But, since the 1952 arrangement would precede the new construction, O’Malley and the Dodgers wanted to wait and transfer the installation of lights to Holman Stadium, which would also permit use of the park for other city sports activities. Holman himself wrote O’Malley in Brooklyn and tried to assist in smoothing over the Vero Beach City Council members who were opposed. Eventually, a deadline for installation of lights was extended per O’Malley’s request from June 15 to July 30 to work everything out satisfactorily. 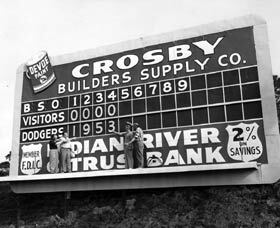 Dodger Manager Charlie Dressen (far left) and Walter O’Malley (second from left) stand in the Holman Stadium scoreboard in right field to promote the upcoming 1953 season. Vero Beach tourism grew largely because of the association with Dodgertown.